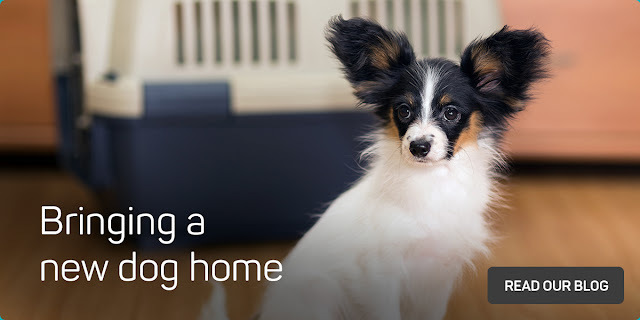 What you do in the first 12 to 24 hours when you first bring a dog home is critical to the success of the dog settling in and becoming a much loved, valuable member of the family. Before you get your dog make sure all the paperwork is done properly. Purchase a strong collar and leash or maybe a harness if you are picking up a small dog. Take the dog out of the shelter and for a walk around the area. Be cool and calm and at this point don't make too much fuss of the dog. If you have chosen a dog that has dominance issues you will be telling it that you are beneath it and that it can take control. You don't want this to happen to be firm but gentle with your new dog. Choose where the dog is going to sit in the car on the way home before you get in. I know children will want the dog to be near them but is it safe for the dog or the children? The dog might vomit or bark and jump around and you don't want your children getting dirty or hurt. I would recommend a strong car harness or a steel crate for traveling in the car. Most car harnesses are designed for walking too and you will always find a use for a crate both in the car and at home. If you have another dog have someone else bring the dog to a park. Do not pick up the new dog with the existing dog in the car as dogs will try and protect their territory and this will include your car. You don't want a fight on your hands on the first day. Meeting in a neutral area like a park will give both dogs a chance to sniff each other and get along with each other without the need to defend territories. If you can and it is safe to do so, let them off leash. Dogs know they are cornered when they are on a leash so by allowing them a little freedom you may avoid any unwanted aggressive behavior. There is information at the Messy Pawz Dog Training Website regarding introducing a new dog into your home when you have an existing dog that you will find useful. When you arrive home to take the dog on a leash around the backyard and then into the house. Show it where it's going to sleep. Give it a drink of water and a little bit of food. Then take the dog for a walk around your neighborhood for at least an hour. Walking is a great way to bond with your new friend. It will also help your dog use up any unwanted nervous energy. If you have a cat, it won't appreciate this new intruder so it might be best to let them introduce themselves slowly over time and from a safe distance. Your new dog may become aggressive towards your cat and frighten it. Your cat may become aggressive towards the dog and frighten it!! Cats don't handle any change in their routine or their environment so try to keep things peaceful for its sake by not forcing friendships. Try to feed the dog on what it had in the shelter for the first week then slowly wean it off to what you want to feed it over the next two weeks. You don't want your dog getting an upset stomach from a dramatic change in diet. Also, feed your dog at the same time as it was fed at the shelter for now. Remember the first night at home is going to be the hardest for your new dog. You have done the right thing by rehoming it but it doesn't know that. It will take time for your new dog to adjust, some dogs longer than others. However, if you are patient and prepared, you will soon have a loving companion to share your life with.